How has jazz changed you? 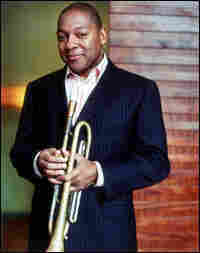 Jazz legend Wynton Marsalis says that music is the "art of the invisible" — it is memory, intention and imagination. 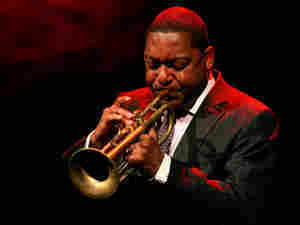 Marsalis explains his relationship to jazz in his new book, Moving to Higher Ground: How Jazz Can Change Your Life. "Jazz music is America's past and its potential," Marsalis writes, "summed up and sanctified and accessible to anybody who learns to listen to, feel, and understand it. The music can connect us to our earlier selves and to our better selves-to-come. It can remind us of where we fit on the time line of human achievement, an ultimate value of art." Kids were supposed to stay in the back room. But some kind of way I stumbled into the front room of this tiny wood-frame house in Little Farms, Louisiana. I must have been four or five years old at the time, but I remember it was dark in there, lit only by a soft blue light or a red one, and a lot of grown-ups, men and women, were snapping their fingers on two and four and grooving to a rhythm and blues song. Some sang the words, but they were all dancing up a healthy sweat. I didn't know what was going on back then, but I could tell it was something good — so good I wasn't supposed to be around it. Well, I could be around the music, couldn't miss it, actually. R&B was always on the radio: "Baby this" and "Baby that"; "I need you, girl"; "Why'd you leave me? Come back. Ohhh!" That music was a way of life. Everybody knew those songs and everybody loved them: "I Heard It Through the Grapevine"; "Stop! In the Name of Love"; "Lean on Me"; "Papa's Got a Brand New Bag." Now, jazz was different. That's what my father played: modern jazz. No one danced to it, ever. That had something to do with rhythm. The backbeat of R&B was steady and unchanging. The rhythms my daddy and his friends played were ever changing and many, a torrent of ideas that came together and felt good. I later came to know it as swing. The first jazz gigs I remember going to with my older brother Branford were like recitals. Only a handful of older people turned up. Some gave us candy, and there was always a good opportunity for us to run around. I noticed that very few black people seemed to like this kind of music. As a matter of fact, so few people understood it, I wondered why my father and his friends bothered to play it at all. Then, when I was about eight or nine, I began to notice something very strange. Even though most of the people in our community would never attend a jazz concert (or anything artistic, for that matter), even though they didn't even consider playing music to be a profession, they had a type of respect for my father. I figured it had to have something to do with jazz, because he certainly was not in possession of any material goods indicative of even the slightest financial success. I began to pay closer attention to all the jazzmen who came to our house or played with my father in clubs around New Orleans. They were an interesting group, if you could get past how different they seemed to be. First, they had their own language, calling one another "cats," calling jobs "gigs" and instruments "axes," peppering their conversations with all types of colorful, pungent words and unapologetic truisms. Even if you were a child, they spoke directly to you and might actually listen to what you had to say. Of course, they talked about men and women, politics and race and sports. But above all, they loved to talk about jazz music, its present and its past at once, like it was all now: "'Trane and them was playin' so much music I couldn't move. And people had been telling me all week they weren't playing nothin'. Man, the music stood me up at the door." They could go on and on about what different musicians played or did or said, great men who all seemed to have colorful names: "Frog," "Rabbit," "Sweets." It seemed to me that all of these people knew one another or at least had some type of connection. For all of that hard, profane talk, there was an unusual type of gentleness in the way they treated one another. Always a hug upon greeting and— from even the most venerated musicians—sometimes a kiss on the cheek. A natural ease with those teetering on the edge of sanity. A way of admonishing but not alienating those who might have drug problems. Always the feeling that things in our country, in our culture, in our souls, in the world, would get better. And beyond that, the feeling that this mysterious music would someday help people see how things fit together: segregation and integration, men and women, the political process, even the stock market. That's why these were still confident, optimistic men. Even though they were broke and misunderstood, sometimes difficult of personality, sometimes impaired by a too intense encounter with mind-altering substances and trapped in a culture that was rapidly moving away from professional levels of musicianship, romantic expression, and the arts in general, they still believed in the value of this jazz they played and still understood that their job was inventing music—and making sense of it with one another. Now, the ability to improvise—to make up things that could get you out of a tight spot—well, everyone needed to know how to do that, even if it was just coming up with the right words at the right time. I thought there must be something to this improvised music. I needed to learn more about it. And hanging around jazz musicians was a great education for a nine- or ten-year-old because they told great stories and they knew how to listen. That was their way, talking and listening, listening and talking. My father could talk for hours, still can. But he would also listen intently and never respond in that patronizing way that drives kids crazy. I have all kinds of memories of telling him partially fabricated stories of what I had done in a football or basketball game and him just standing there listening intently to every detail and cosigning, "Uh-huh. Yep." When he and other jazzmen listened to records or the radio, they could hear all kinds of things I didn't come close to noticing. I couldn't understand how three notes from a tenor saxophone was all they needed to conclude, "That's Gene Ammons," "Yeah, that's 'Jug,' " or "Monk, I hear you, Thelonious!" That seemingly magical ability to hear made me figure that perhaps my father knew when I was embellishing stuff. He and his friends seemed to be able to follow every moment of what the person played. Now, you have to remember, the rest of us were listening to three-minute records of tunes with words, words that were as easy to memorize as the thirty seconds of repeated musical accompaniment. But these guys were listening to things like Sonny Rollins's "Al•e's Theme," seven or eight minutes of somebody playing all kind of saxophone up and down the horn, following it as if it were spoken by the oracle at Delphi, saying, "Tell your story," and so on. There would be certain points in the music where the "um-hmms" became "ohhh" or "oowee! "—the type of ecstatic eruptions that overcome some people in church. They would respond to Sonny as if he were right there in the room, and during all that seven or eight minutes not one word on the recording, spoken or sung! And I'd be sitting there listening to them speak in what was almost a foreign language, trying to understand, wanting to learn it. At twelve, I began listening to John Coltrane, Clifford Brown, Miles Davis, and Freddie Hubbard. Just by paying serious attention to these musicians every day, I came to realize that each musician opens a chamber in the very center of his being and expresses that center in the uniqueness of his sound. The sound of a master musician is as personalized and distinct as the sound of a person's voice. After that basic realization, I focused on what they were communicating through music—pure truth, delivered with the intimacy of friends revealing some secret, sensitive detail about themselves. It takes courage and trust to share things. Many times the act of revelation brings someone closer to you. In learning about a person, you learn something about the world and about yourself, and if you can handle what you learn, you can get closer, much closer to them. That's why, I came to understand, the scuffling jazzmen around my father were so self-assured. They didn't mind you knowing who they were. With Coltrane, of course, I was impressed with his virtuosity, his ability to run up and down his horn. Everyone who heard him was. But I noticed that the most meaningful phrases were almost never technically challenging. They were succinct phrases that would run right through you, the way profound nuggets from Shakespeare's plays can both cut through you and linger; all those words in Hamlet, but you remember "To be or not to be" or "to sleep perchance to dream." Something in those types of phrases reveals universal truth. The best way I can describe this is by comparing it to the feeling between two people. Before any words are spoken, before one makes any gesture toward the other, there is a feeling. And that feeling loses intensity and purity when translated into words or gestures. When someone reaches up to kiss you or says, "I love you," those acts are reductions of that bigger feeling. But if someone figures out how to communicate that big feeling—how to master a moment of soul—he or she just looks at you with directness and honesty and love. Eyes alone can warm your entire body. We most often experience this unencumbered feeling from children. But some adults give it, too. Because jazz musicians improvise under the pressure of time, what's inside comes out pure. It's like being pressed to answer a question before you have a chance to get your lie straight. The •rst thought is usually the truth. That purity of feeling is what I heard in Coltrane's sound. His sound was his feeling. You also heard Tommy Flanagan's feeling when he improvised at his piano; then you had Paul Chambers's feeling on the bass and Art Taylor's on the drums. A single performance was an improvised symphony of their combined feeling, made more honest by the pressure of time. It's not easy to find words for the kind of emotions that jazz musicians convey. You don't have a name for the feeling of light peeking through the drapes in your childhood bedroom. Or how the teasing by classmates hurts. You don't have a name for the feeling of late-night silence on a car ride with your father or how you love your wife 's smile when you tease her. But those feelings are real, even more real because you can't express them in words. Jazz allows the musician to instantly communicate exactly how he or she experiences life as it is felt, and the instant honesty of that revelation shocks listeners into sharing and experiencing that feeling, too. Some popular music evokes nostalgia. Your memory of your own emotions fills the songs with meaning: "You remember this one, baby? This was when I had that old beat-up Oldsmobile and used to pick you up in it and this was our prom song." But jazz music is about the power of now. There is no script. It's conversation. The emotion is given to you by musicians as they make split-second decisions to fulfill what they feel the moment requires. The explanation can be complicated, but the music is very direct and basic. And because Coltrane felt so strongly about things, his sound remains potent and present. We can still feel him and Louis Armstrong and Thelonious Monk and all of the great ones. And we can feel and empathize with many other musicians, too, if we allow their sounds to reach and fill some space inside of us. Jazz makes it possible for individuals to shape a language out of their feeling and use that very personal language to communicate exactly how the world feels to them. Recordings froze the sounds of these musicians, affording us the pleasure of entering their world whenever we wish. The world according to Lester Young. Mmmm. That's where I want to be. Then, to be there over and over again. The best jazz for me back then, however, was always live. I loved to hear my father and James Black or Clark Terry or Sonny Stitt electrify a room. Live, the music unfolded right in front of you. All over you. Now, at first I could hear and relate to 'Trane's sound but didn't necessarily understand what he was playing. It was hard to follow. One solo had enough music for about forty of the radio songs that I could comprehend. But I kept trying to hear and follow, like a kid listening to adult conversation. Then, one day, I could actually understand—not in my mind but in my heart. It came to me all of a sudden. What he was playing made perfect sense, actually super-sense. These musicians were telling stories. And these bittersweet stories unfolded in unpredictable ways. The musicians themselves were often surprised by their inventions. But they worked with the surprises the way a bull rider adjusts his weight and angles to stay onboard. It was a language, and after you could comprehend the song of the language there was no need for words. The song is the language. The song was the language. When I started learning about jazz, I wasn't into any kind of art. I had no idea it could have a practical purpose. Now, more than thirty years later, I testify to the power of art, and more specifically jazz, to improve your life—and keep on improving it. I know now that my father and his fellow musicians possessed such confidence because of their relationship with an art form. Although they struggled with our way of life, with segregation and all types of small unnamed injustices, with personal situations that were as full of drama, unhappiness, and strife as anyone else 's, they enjoyed who they were. I noticed that religion gave some people a way to escape dealing with the world: "Things will be better when you die," the people of my grandma's generation said as they worked themselves to death. "God wants you to forgive and love those who do you wrong," some people said to shake off the shame of being unable to respond to the abuse they endured. The holier-than-thou faction found comfort in believing, "The rest of y'all are lost because you don't have a personal relationship with God—our God." But art engages you in the world, not just the world around you but the big world, and not just the big world of Tokyo and Sydney and Johannesburg, but the bigger world of ideas and concepts and feelings of history and humanity. I learned that jazz has the power to help anyone willing to engage it. Some people think music communicates only when it accompanies lyrics—that's why pop music almost always has words. But as in all art, whether we encounter a great play or poem or painting, artists can carry us to a common place: When they cry, we cry; when they are excited, we become excited. And jazz music, because it is mostly wordless, allows musicians to express deeper, more varied, and ever changing states of being. It can provide musicians and listeners alike with a sense of self, a concept of romance, a more comfortable physicality, a deeper understanding of other human beings. It is an endless road of discovery leading to more maturity and acceptance of personal responsibility, a greater respect for cultures around the world, an invigorating playfulness, an excitement about change, and an appetite for the unpredictable. It gives you a historical perspective, a spiritual acceptance of necessary opposites, an undying optimism born of the blues—and a pile of good listening. I went through my teen years playing all kinds of music. But jazz became my real love. I grew up with it and wanted to be able to play it. This was the 1970s, when most of what we thought of as jazz was some funk tunes with horns playing the melody. But my exposure to real jazz musicians at an early age helped me realize that this music had a different function from the pop music we loved and played. The most popular music of my youth thrilled people with illusion, sentimentality, and showmanship. Music was just one of the tools we employed to create excitement. The jazzman's objective, however, was solely musical: Through his improvisation, he wanted to take people deep into his actual feelings and his world. Ironically, I was in the same position Bix Beiderbecke found himself in when he first heard jazz music as a teenager in Davenport, Iowa, in 1917. Most of the people around him thought jazz was some kind of hokum, a gimmicky fad that—to make matters worse—was created by black people who weren't worth anything, anyway. But through intense listening, Bix could hear past all that ignorance and racism and learn to hear the differences among black groups, white hokum groups, and white groups like the New Orleans Rhythm Kings, who could really play. He could recognize artistic objectives, too, and set out to become an artist himself, even though pursuing those objectives would drive him farther and farther away from the world in which he grew up. Like Beiderbecke, I wanted to figure out what separated jazz from what we were being told was jazz. What is jazz really saying? Is it still of value? The most prized possession in this music is your own unique sound. Through sound, jazz leads you to the core of yourself and says "Express that." Through jazz, we learn that people are never all one way. Each musician has strengths and weaknesses. We enjoy hearing musicians struggle with their parts, and if we go one step further and learn to accept the strong and weak parts of people around us and of ourselves, life comes at us much more easily. A judge has a hard time out here. Miles Davis, for example, couldn't play with the big sound of Louis Armstrong, but he found his own type of intensity at a softer volume. He would release recordings with mistakes, and they still sound good. The imperfections give the music even more flavor and personality. In this era of young people starving themselves to attain some Madison Avenue or TV version of thinness and perfection, the idea of "working with what you have" provides a more useful alternative. Jazz also reminds you that you can work things out with other people. It's hard, but it can be done. When a group of people try to invent something together, there's bound to be a lot of conflict. Jazz urges you to accept the decisions of others. Sometimes you lead, sometimes you follow—but you can't give up, no matter what. It is the art of negotiating change with style. The aim of every performance is to make something out of whatever happens—to make something together and be together. Back then, these two revelations—the importance of expressing the core of your unique feelings and the willingness to work things out with others—gave me more than I needed to address the increasingly complex personal relationships that can be unbearable for a teenager. On a basic level, this music led me to a deeper respect for myself. In order to improvise something meaningful, I had to find and express whatever I had inside of me worth sharing with other people. But at the same time it led me to a new awareness of others, because my freedom of expression was directly linked to the freedom of others on the bandstand. I had something to say, and so did they. The freer they were, the freer I could be, and vice versa. To be heard demanded that we also listened to one another. Closely. And to sound good we had to trust one another. Of course, I'm talking especially about the benefits of playing, but it goes for listeners, too. The value of jazz is the same for listeners and players alike because the music, in its connection to feelings, personal uniqueness, and improvising together, provides solutions to basic problems of living. Deeper levels of listening yield even more benefits. As in conversation, a musician knows when people are listening—and inspired listening makes for inspired playing. Knowing jazz music adds another dimension to your historical perspective. I have read about the Great Depression, and I knew and played with people who lived through it. But when you listen to Mildred Bailey or Billie Holiday, Benny Goodman's orchestra or Ella Fitzgerald with the Chick Webb orchestra, you gain insight into those eras: the language they used; how they employed humor and stereotypes to bridge the gulf between ethnicities; their conception of romance as reflected in the interactive grooves they danced to; how sweet, hot, and Latin music came together. You can hear that people were figuring out a way to celebrate and define their existence joyously in spite of—and to spite—the hard times. Not just with happy tunes but with the verve and downright swing—the jubilant back-and-forth rhythm—that jazz musicians brought to every kind of tune, even songs of pathos and loss. Jazz fills the dry facts of American history with something sticky and sweet. The greatest artists in any field speak across epochs about universal themes—death, love, jealousy, revenge, greed, youth, growing old—fundamentals of the human experience that never really change. Art and artists truly make us the "family of man," and most of the greatest jazz musicians embody that consciousness. Entering the world of jazz gives you an opportunity to commune with brilliant creative thinkers—Max Roach and Gil Evans, Papa Jo Jones and Mary Lou Williams, and many, many more—and, through the workings of so many diverse minds, demonstrates that there are countless viable ways to improvise—to think through the same problems and deal with them. Some musicians, like Coleman Hawkins, take things apart and reassemble them, piece by piece. Others, like alto saxophonist Paul Desmond, play with clear, dry wit. You might wonder how a musician can be witty. A witty person turns a familiar phrase in a quick and humorous direction; a musician can do the same thing with melodic phrases: You think you know where the next phrase will go, but it goes somewhere else with the timing and power of a good punch line. With jazz, there are as many approaches as there are people who can play. Musicians like Bix Beiderbecke, Miles Davis, and Booker Little focus their intelligence and feelings on creating deep, haunting, heartbroken sounds. Charlie Parker expands our concept of the mind with quickness of thought and mastery of organization at incredible tempi. Louis Armstrong, more than anyone else, figured out how to use the hard-earned realism of the blues to toughen up the sentimental, pie-in-the-sky corniness of many American popular songs. In the process, pop was infused with Afro-American rhythm and artistic elevation through the art of improvisation, and jazz gained a body of superbly crafted melodies and sophisticated harmonies. European composers frequently used folk themes, the popular music of their day, as points of departure for fantasies and freewheeling compositions that utilized all kinds of complex compositional techniques, from fugue to serialism. The jazz musician, on the other hand, almost always maintained the rhythm and harmonic structure of the melody when improvising. From traditional fiddlers' reels and church music to the blues and the nineteenth-century cornet soloists who performed spectacular variations on popular themes like "The Carnival of Venice," most improvising in American music has followed a theme-and-variations pattern. Louis Armstrong inherited all of these traditions. He improvised not only on the melody and harmonies of popular songs but on their sentiments as well, taking us through spontaneous ruminations on a startling range of human responses to the idea of romance, from heartbreak to absurd humor to excruciating tenderness. He showed jazz musicians all around the world how to improvise on the most universal of human themes, what Duke Ellington called "the world's greatest duet, a man and a woman going steady." American standards—the best-loved popular songs of the 1920s, '30s, and '40s—became the framework for the jazz musician to build on, rich source material covering almost every known circumstance, from adolescent gullibility to middle-aged apathy to dysfunction in old age. Jazz musicians have such respect for these songs that the great tenor saxophonist Ben Webster once stopped in the middle of his instrumental improvisation because he "forgot the words." With jazz, affairs of the heart are open to many interpretations. And because all you have to do is learn an instrument and some harmonies, and because you can invent your own compendium of late-night vibratos and effects, and because the pressure of time forces you to be spontaneous, and because intimacy and honesty are more practical than formality and convention, and because you don't have to learn composition and orchestration—and because of the absolute realism and hard-won joy of the blues—jazz musicians get closer to expressing the actual diversity in the ways of love than any musicians before them. There is the transcendent sensuality of Johnny Hodges, the super-sensitive secrecy of Miles Davis, the distanced but expert elegance of Duke Ellington, the acerbic sweetness of Stan Getz, the playful sexuality of Harry "Sweets" Edison, the heartbroken laments of Billie Holiday. Each of these musicians—and many more—gives you a tour of the sweet ups and downs of romance. Their discoveries can give you the con•dence to step into your own feelings, to recognize the uniqueness of your partner's feelings and let them unfold, to revel in those soft moments and not be afraid of the silences that can make them even softer. Jazz is the art of timing. It teaches you when. When to start, when to wait, when to step it up, and when to take your time—indispensable tools for making someone else happy. Time is the lifeblood of jazz. Not the time told by a clock or even the time signature on a piece of music. Swing time: the quality of the quarter notes played by the bass down low and the cymbal up high as they shuffle through a song. ("Frère Jacques" is made up of quarter notes; replace the words with doom and you'll be singing a swinging bass line.) The triplet-based shuffle rhythm invites all kinds of dynamic figurations on the piano and horns. (If you want to know what a triplet is, think of any Irish jig.) Everyone dances, and the bass and drums hold it all together. They are like the man and woman in a family, two extremes of register and volume coming together. The quality of their negotiation affects the quality of the time. If they get along, things go smoothly. If they don't, you have a lot of interesting stories to tell. My father and his friends had just two questions about a new musician: "Can he play?" meaning, "Does he have good ideas and a distinctive tone?" and "How's his time?" meaning, "Does he create a good-time groove with his rhythm?" Jazz can teach us how to be in time. There are always three kinds of time at play when you're on the bandstand: actual time (the dry, relentless passing of seconds and minutes), your time (how the passage of actual time feels to you), and swing time (how you adjust your time to make actual time become our time). Actual time is a constant. Your time is a perception. Swing time is a collective action. Everyone in jazz is trying to create a more flexible alternative to actual time. Bass and drums become the foundation of swing time, and the rest of the band interprets the swing from their rhythmic viewpoint. Some rush, some slow down, some play right on the beat. But all shift back and forth, trying to find and maintain some common ground. You're in time when your actions are perceptive and flexible enough to flow inside that ultimate constant—swing. "What kind of time are y'all playing? Can you just give me some good time to play on?" "Call me back when y'all are ready to swing." "Can you hear what we 're doing up here! Please, man, stop lagging and join us." Bass players and drummers argue constantly about the time. Generally, bass players rush and drummers drag. So, there's almost always conflict in the kitchen. The rhythm guitarist once served as the referee, but he unfortunately faded from the rhythm section when the big bands stopped being commercially viable. But that rhythm guitarist is the most self-sacrificing of musicians, willing to do less than he or she might do so that others can do more. The rhythm guitar is by far the softest instrument but also the most central. It plays every beat as if to remind us, "Here's home." When everything is right, the rhythm section's like a trampoline: Stiff but springy, it lets everyone else jump around and have a great time. Too stiff or too soggy, and we have a bad time. Science says the only constant is change. But to swing is to alter how we experience that change. The musician's relationship to time can be of ultimate assistance to you in: 1) adjusting to changes without losing your equilibrium; 2) mastering moments of crisis with clear thinking; 3) living in the moment and accepting reality instead of trying to force everyone to do things your way; 4) concentrating on a collective goal even when your conception of the collective doesn't dominate; 5) knowing how and when to expend your individual energy. Being in time also gives you the con•dence to take chances. The beauty of a musician who sits comfortably in time is the many wondrous rhythms he or she can invent. Sonny Rollins comes most immediately to mind. He scrapes the beat, pushes it, leans on it, makes taffy out of it. He takes chances like a great juggler, an acrobat, or an explorer. He says "Let's see what's over here" or "I bet I could combine this with that and make it work." And it does. He plays super-syncopation—the unexpected unexpected rhythm. Thelonious Monk does it, too. It's as if they go deeper into time by •oating out of it. And just when you think they're gone—poom!—they're back again. They show us not only how to navigate change but how to initiate it, inspire it, and revel in it. We're often told that time is our enemy, something we can't control. "Time flies!" "Don't waste time!" "Do it while you're young!" We live in a youth-oriented culture where becoming older is treated like a crime. Older people show you pictures of themselves when they were younger, proud of how they used to be. Younger people can't be bothered with anything having to do with their parents' time (that's old), let alone their grandparents' (that's ancient). But in jazz, someone fifteen can be on the bandstand next to an eighty-year-old. I have seen Sweets Edison in his seventies, Roland Hanna in his sixties, and Reginald Veal in his twenties, all chasing the elusive swing with the same zest and vigor. And believe me, many times the old men would be showing the young ones where to put the beat. 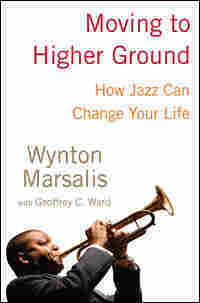 Excerpted from MOVING TO HIGHER GROUND: How Jazz Can Change Your Life by Wynton Marsalis Copyright © 2008 by Wynton Marsalis. Excerpted by permission of Random House, a division of Random House, Inc. All rights reserved.